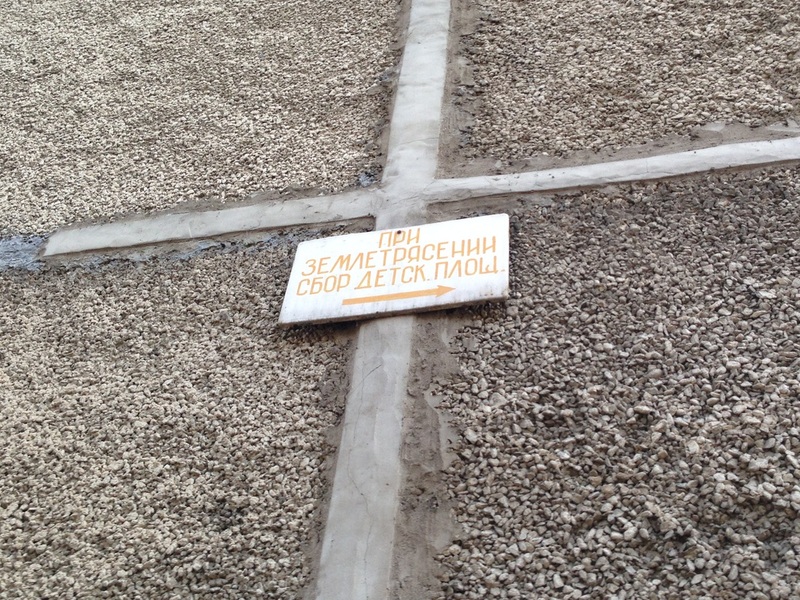 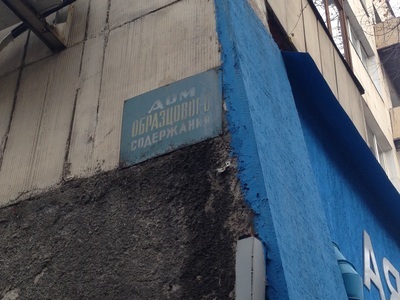 The corner of an Almaty apartment block can be a site of information overload, where multiple signs from multiple eras compete to convey their own message, or worst of all, where multiple signs all want to tell you the same thing, but nobody has bothered to take down the old ones! 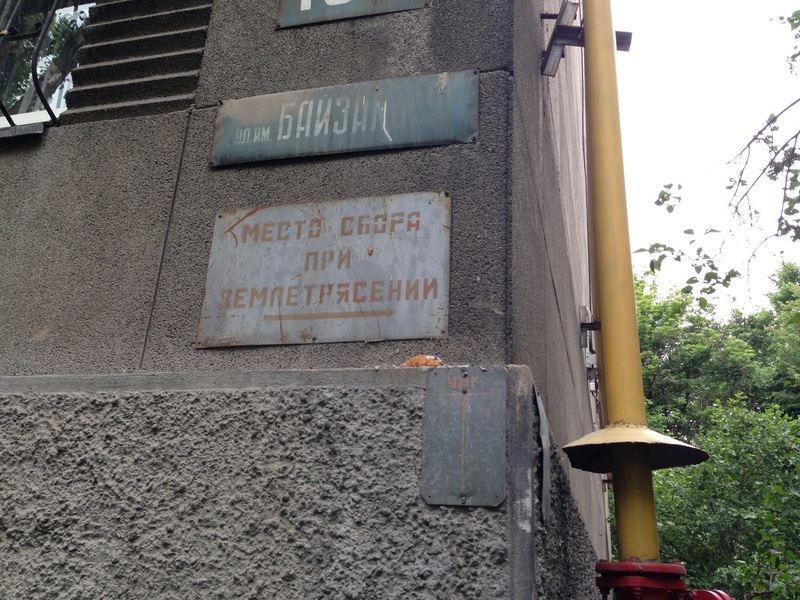 Addresses, of course, are the most common, and fire hydrant indicators proliferate. 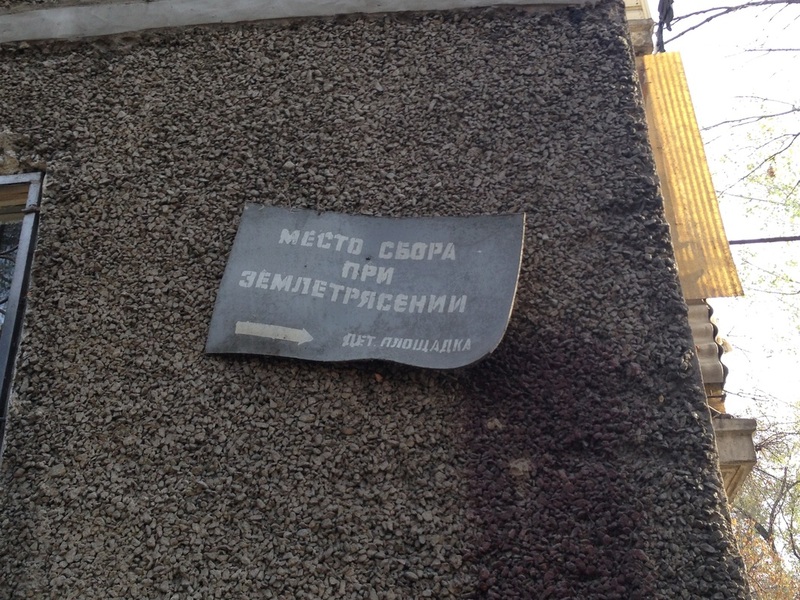 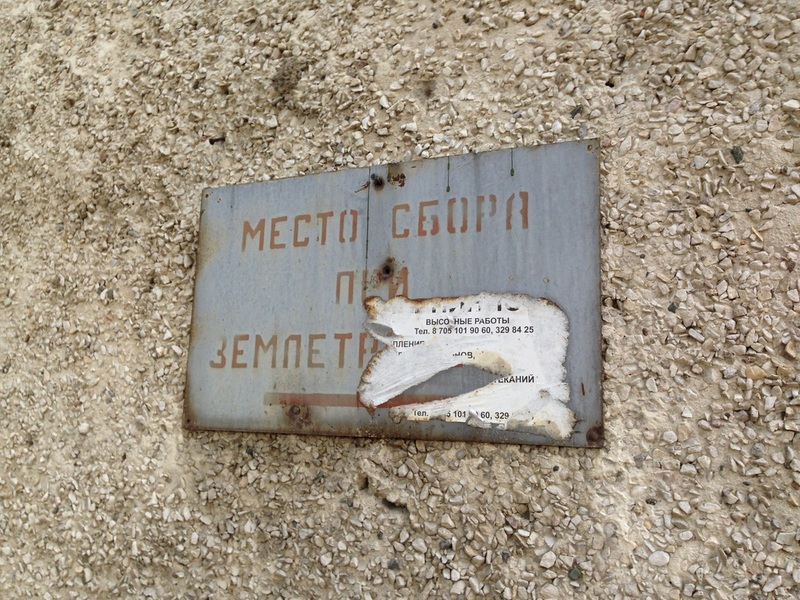 In addition to these, though, there's a whole genre of hortatory metal plates leftover from the Soviet years that urged inhabitants to clean up their homes, to be safe in an earthquake, and even to call a babysitter. 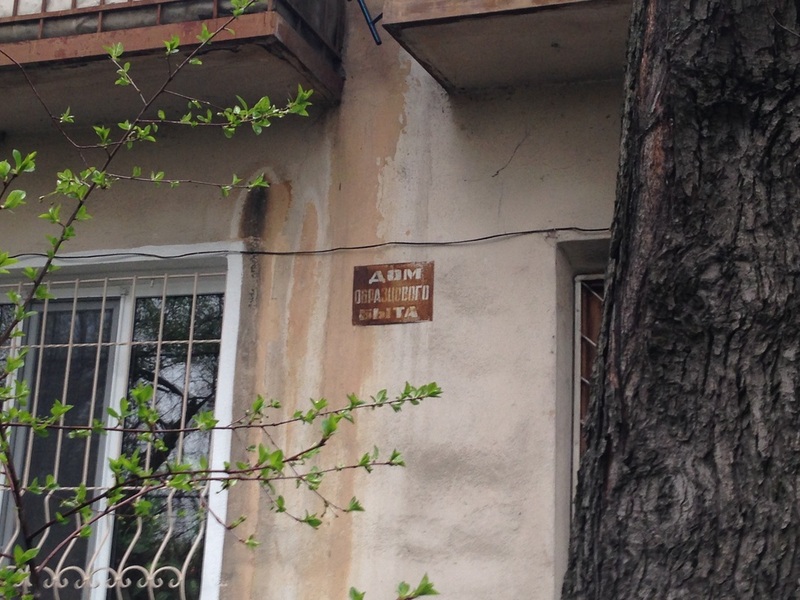 We all learn in Oversimplified Econ 101 that competition is baked right into capitalism, while socialists all plod along in the same boat, for better or worse. 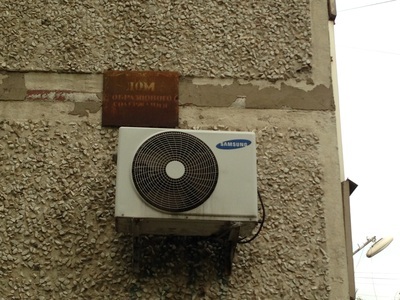 How to motivate those spoiled commies, workers who are entitled to their government apartment whether they sweat for it or not? Lenin's answer was "Socialist Emulation", where citizens of the workers' paradise were urged to set a good example for their countrymen and get medals and prizes in return. 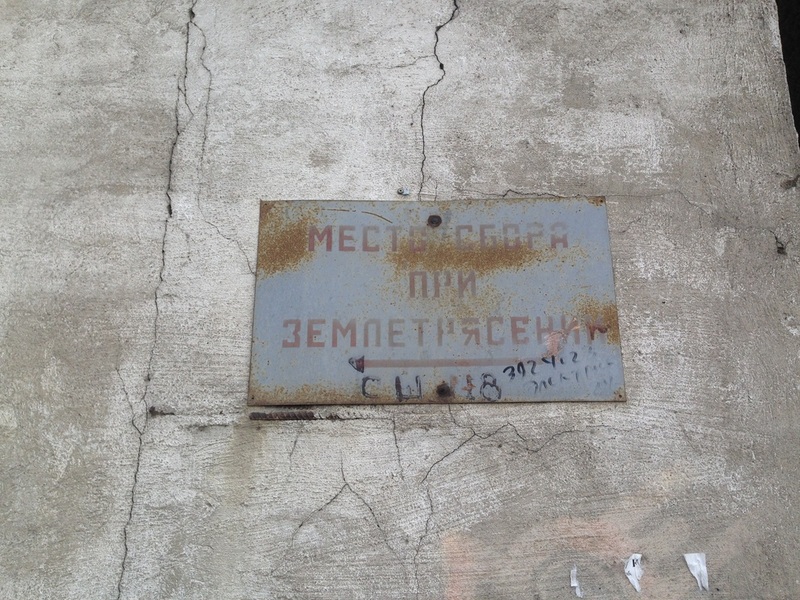 This wasn't like capitalist competition, with its winners and losers; with Socialist Emulation, everybody was encouraged to rise together. 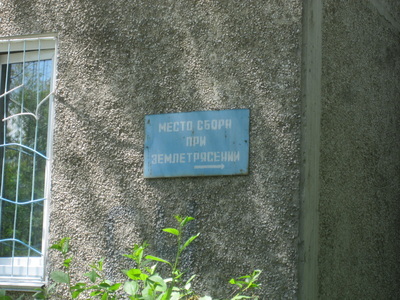 A fine example of this was the annual competition to get your prefab home recognized as a "House of Exemplary Content" [Дом Образцового Содержания; Dom Obraztsovovo Soderzhaniya]. Homes were graded by the cleanliness of their stairwells and elevators, the tidiness of their courtyards, and so on, with bonus points for a pleasant garden. 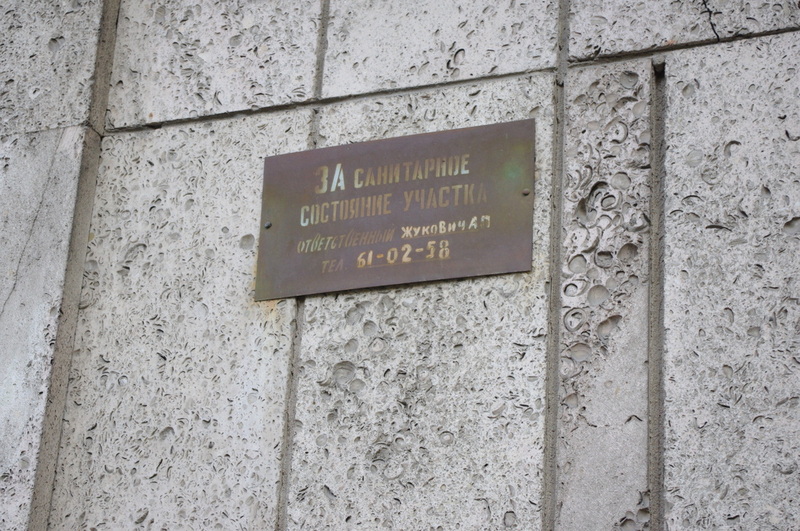 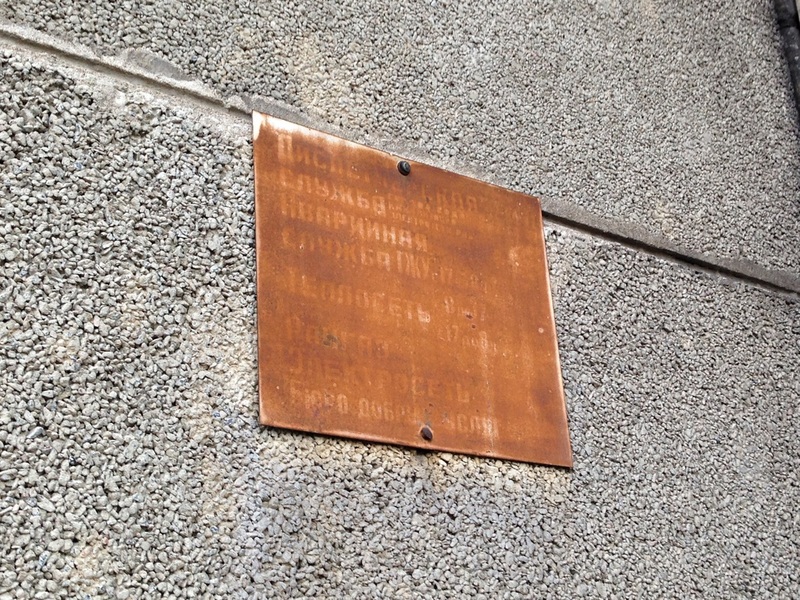 On a given subbotnik (special Saturdays devoted to communal volunteer work), the city administration would conduct a final evaluation and award the finest home with a metal plate that proud communists could then hang at the end of their building. 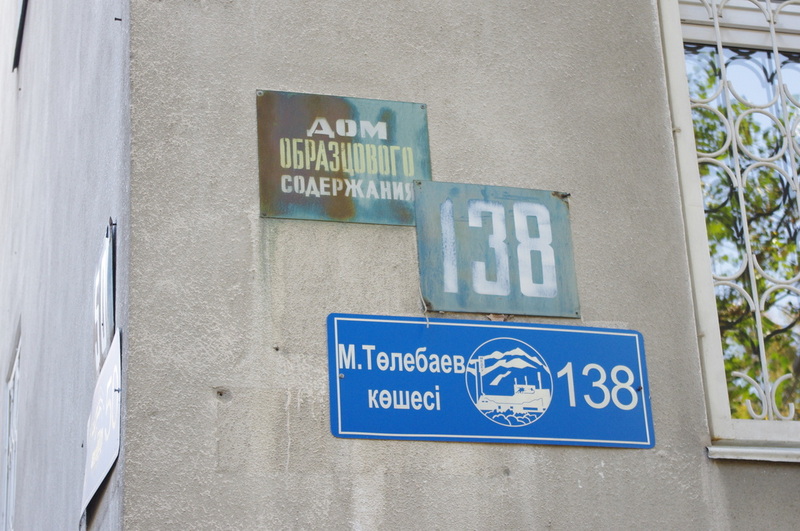 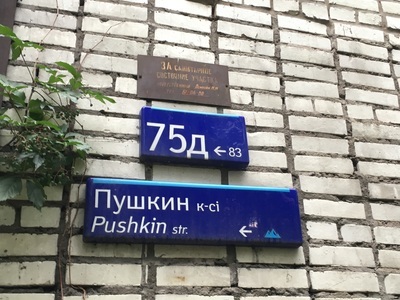 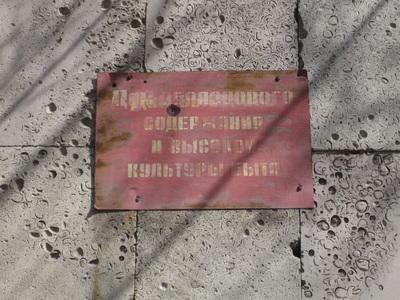 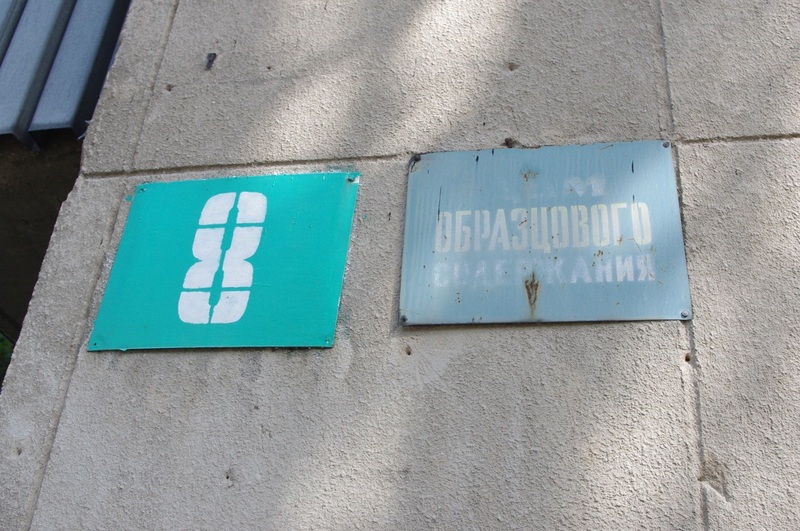 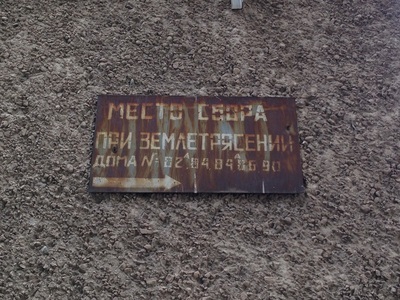 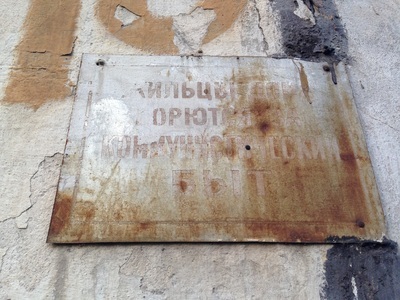 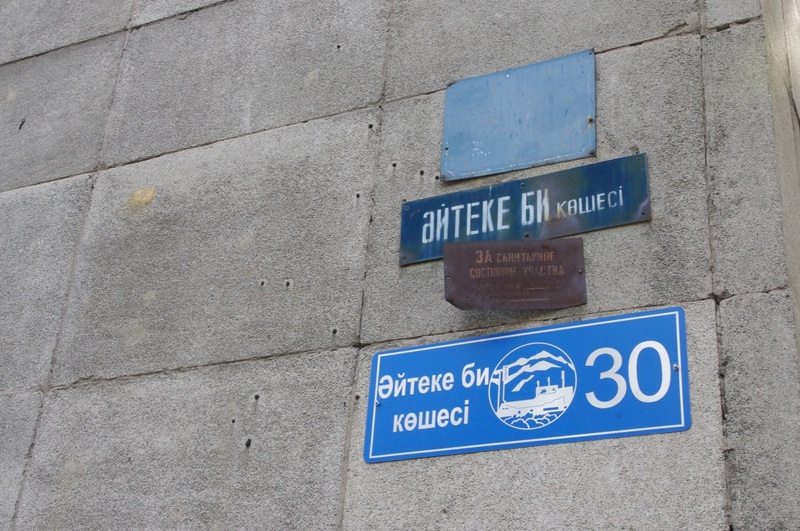 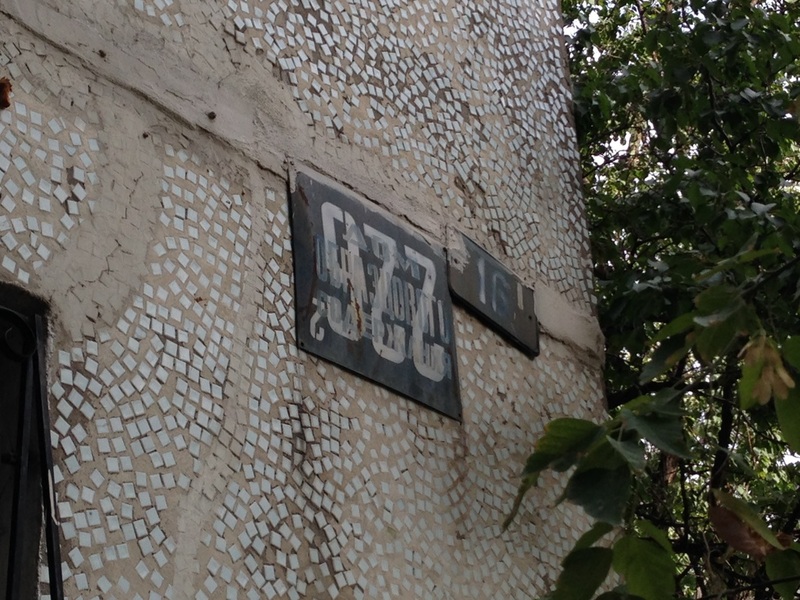 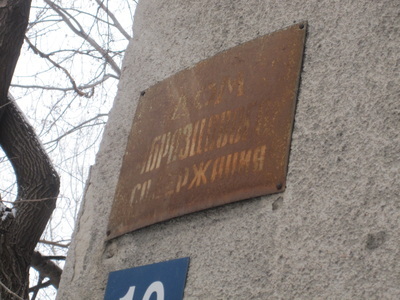 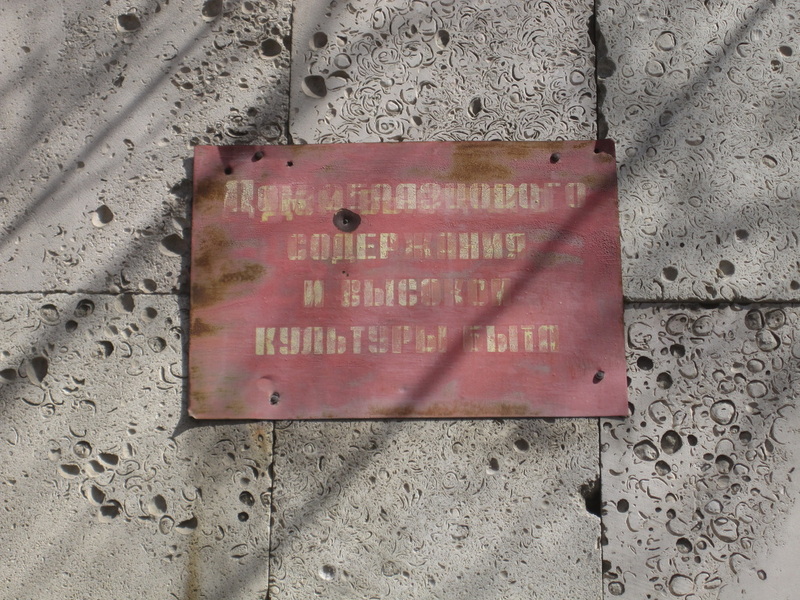 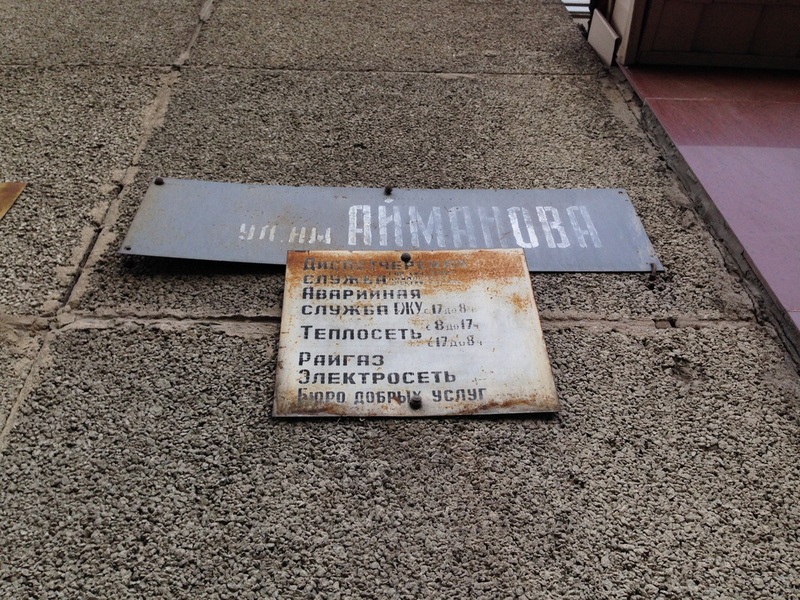 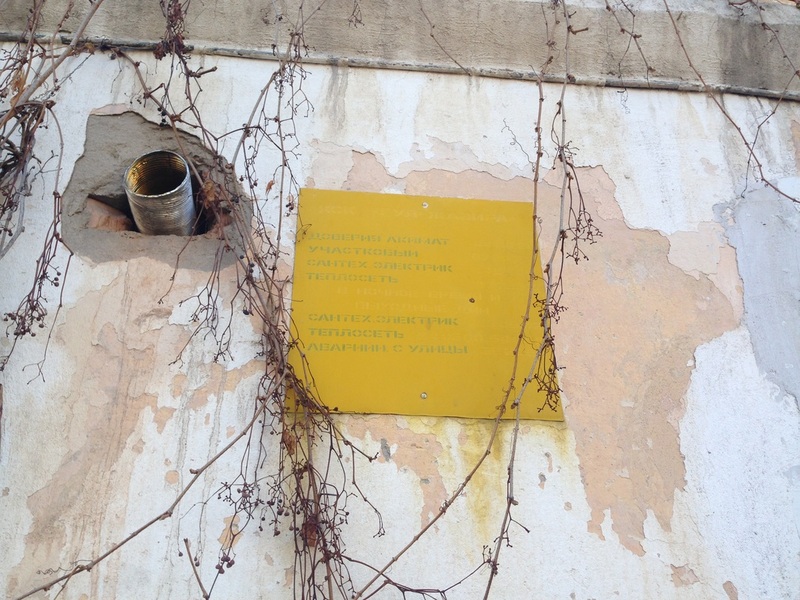 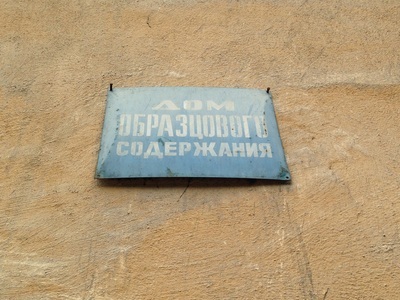 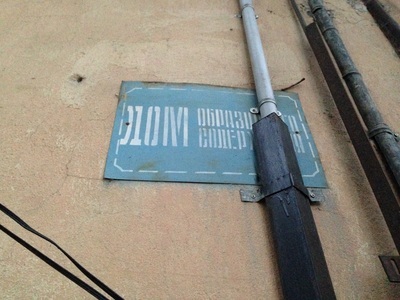 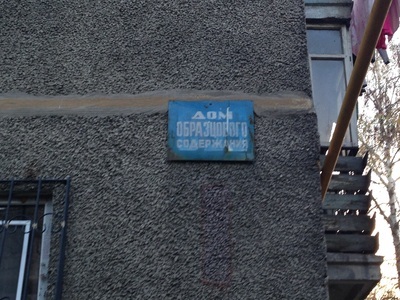 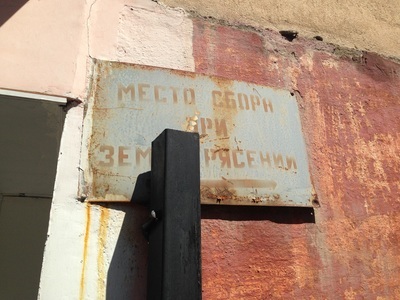 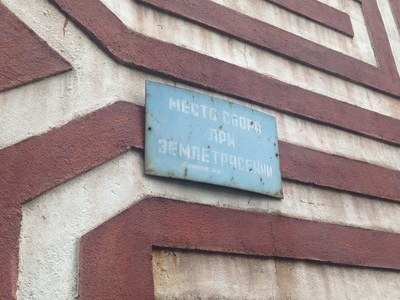 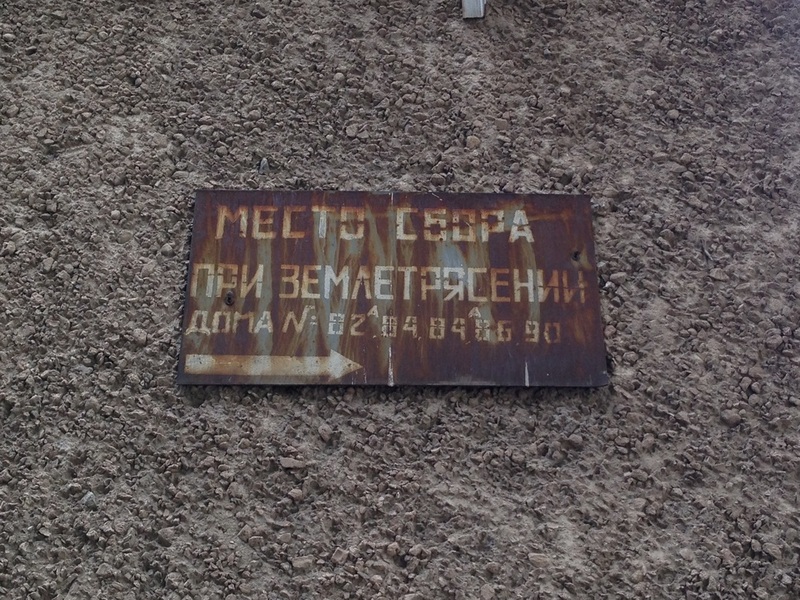 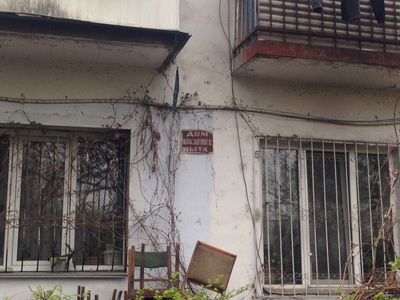 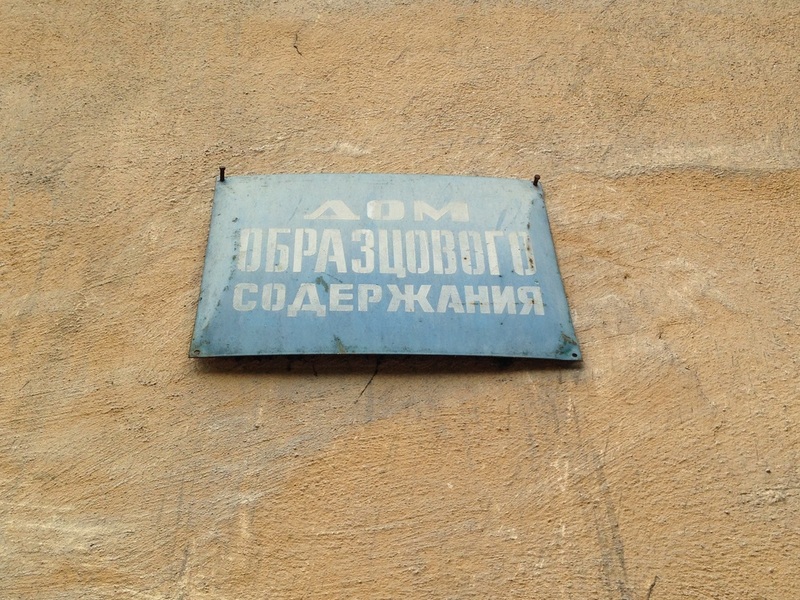 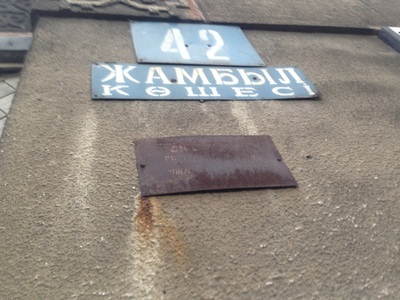 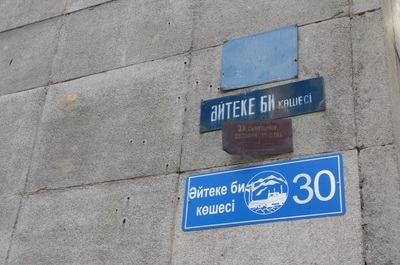 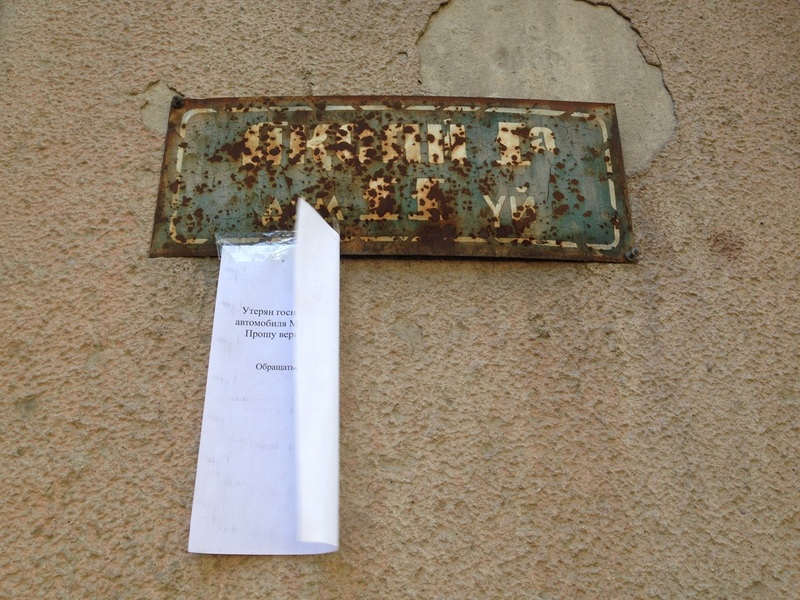 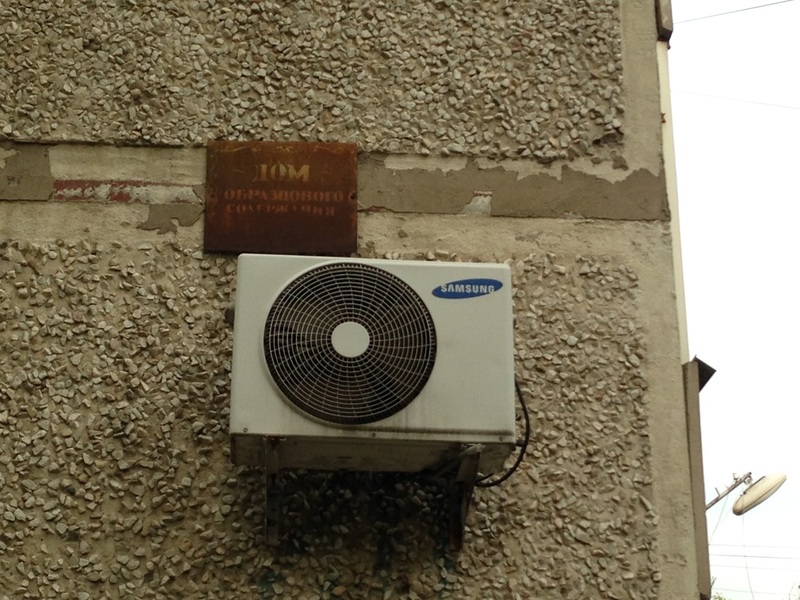 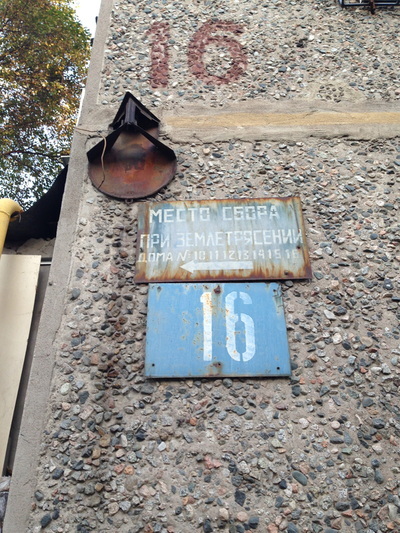 These plates, light blue or rusted red, can still be seen on many of Almaty's old housing projects. 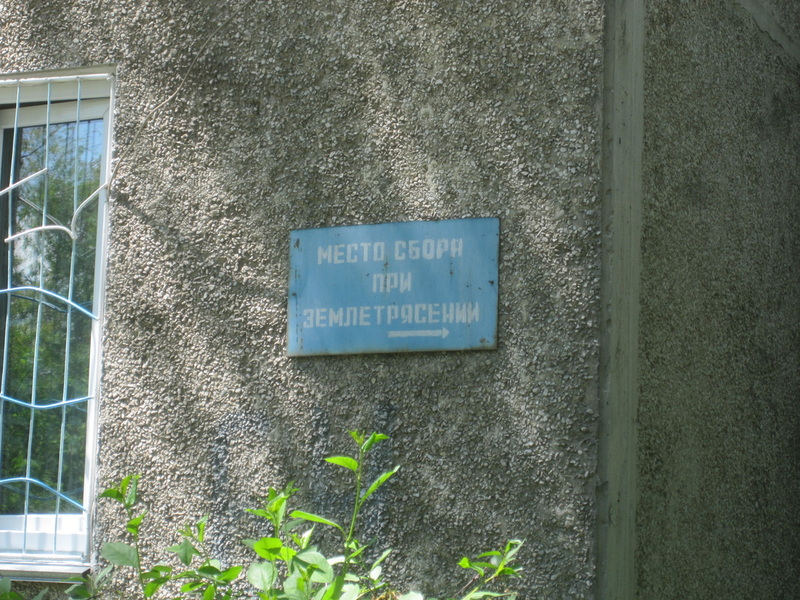 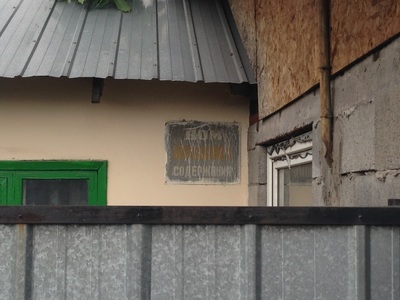 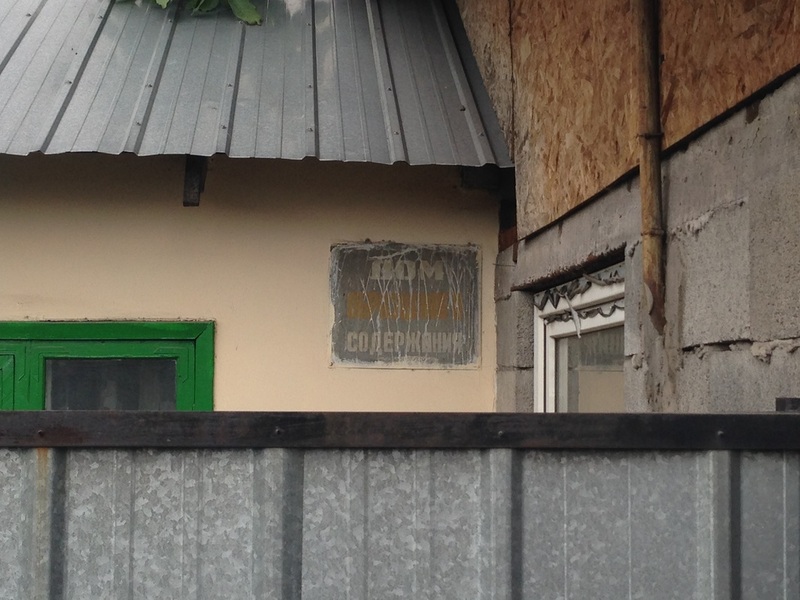 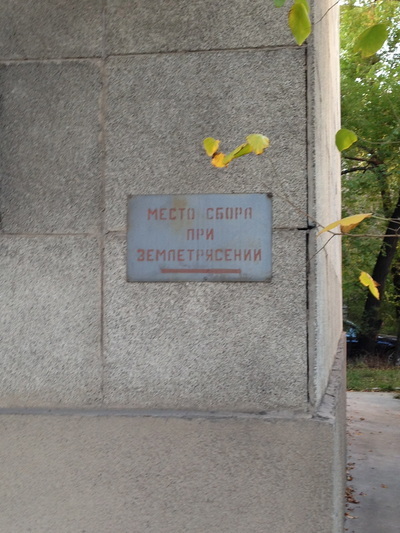 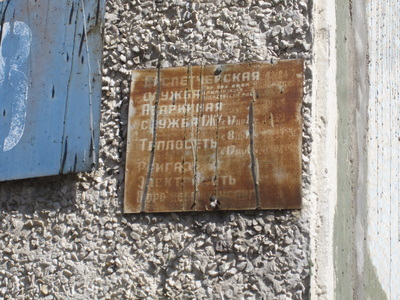 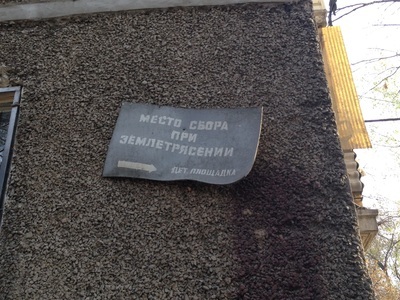 The three-worded signs are most common but if neighbors fostered an especially devoted community, with weekly lectures and reading clubs, they might have gotten an even more elaborate dedication: "House of Exemplary Content and a High Culture of Life" [Дом образцового содержания и высокой культуры быта; Dom obraztsovovo soderzhaniya i visokoy kul'tury byta]. But there's one sign I came across only once that was even more gung-ho. 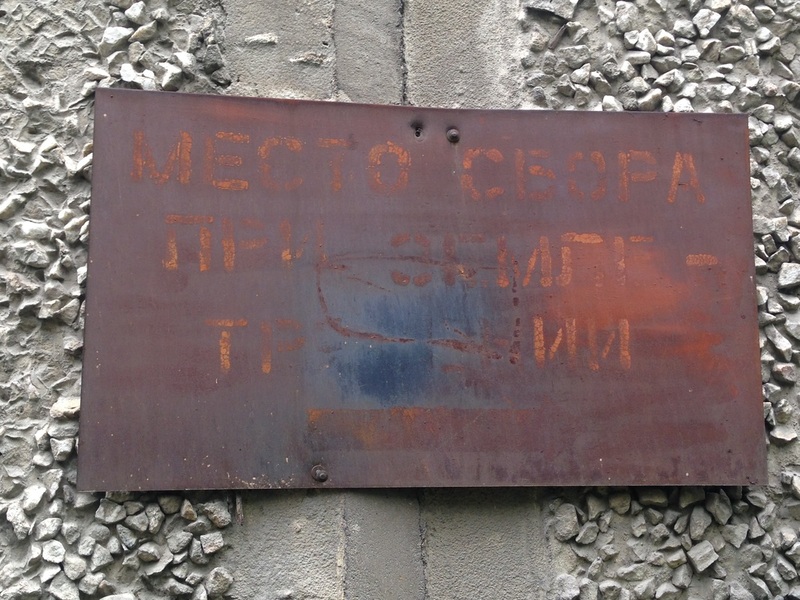 "The inhabitants of this building", it read, "are fighting for the communist way of life!" 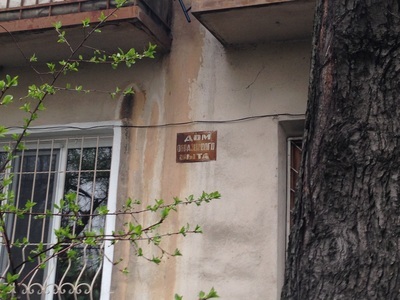 Now that's teamwork. Other times, metal plates were just looking out for your safety. Though not as famous for its seismic gyrations as Japan or California, Almaty is dangerously susceptible to earthquakes. 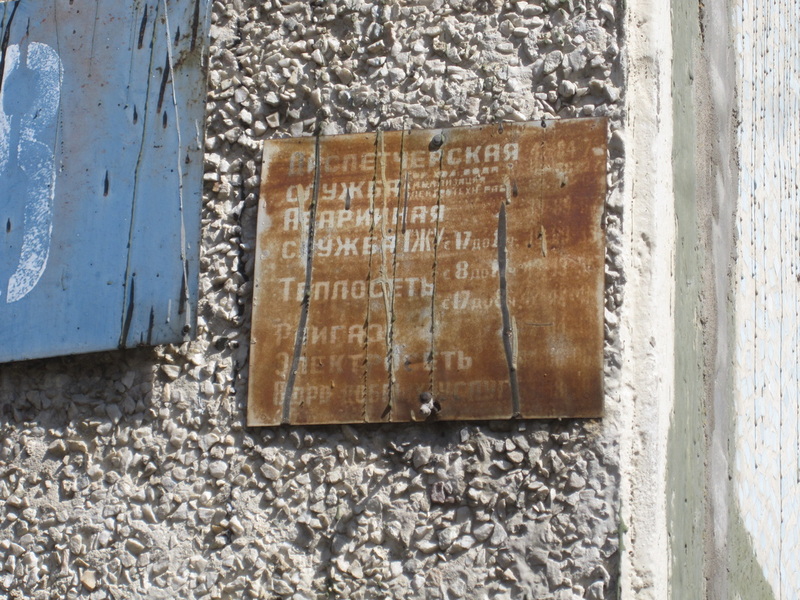 A particularly strong shaker in 1887 devastated the whole town, known then as Verny, and proper construction and awareness was taken seriously ever since. 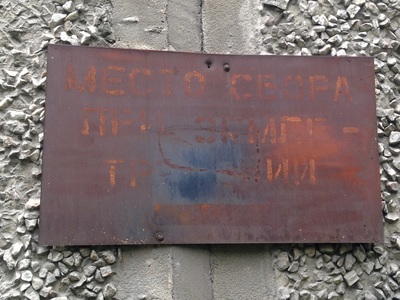 That's why you'll often see silver signs that read "Meeting Place In Case of Earthquake", red arrows pointing the way to a safe zone, usually the inner courtyard. 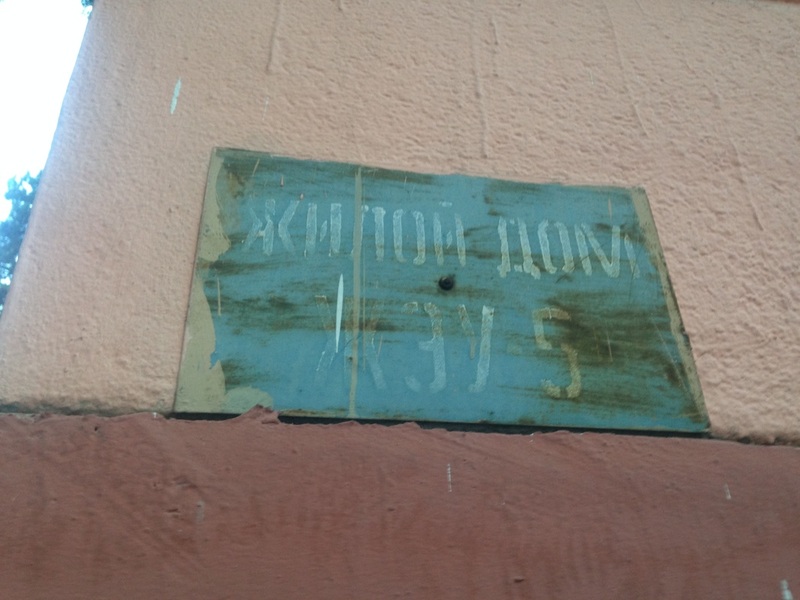 Over time, these signs fade and dent and lose their authority, and if there was an earthquake today, I doubt many Almatians would know where to run, despite the well-meaning directions. 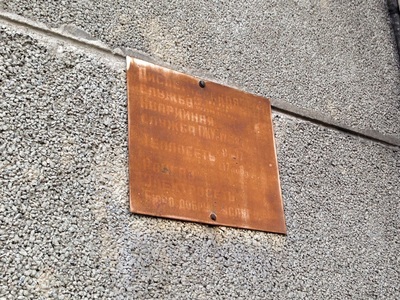 One last class of metal plates that I've seen are the ones that list the services you could reach through the dispatchers of the period - and that even meant who to call for your date night. These signs reminded neighbors how to ring if they had problems with their heating, with their water, with their gas, if they had an accident, and most generously, who to call for a babysitter. 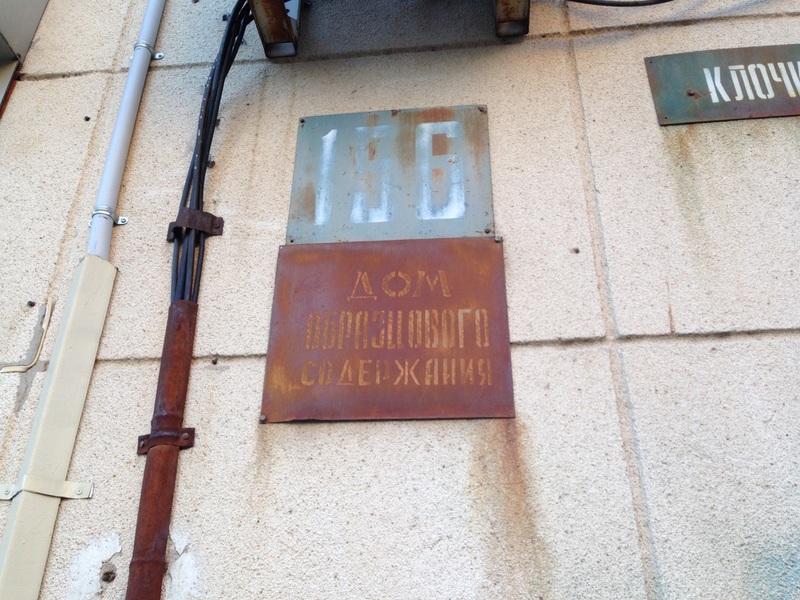 This organization, I learned, was called the Bureau of Kind Services [Бюро Добрых Услуг; Bureau Dobrykh Uslug], and it was kind of a gateway to the Soviet service industry - you could call up a handyman or a nurse, too. These days, the dispatcher signs are charmingly outdated, but there they remain, hanging for decades on the corner of a concrete building, sharing space with warnings and exhortations from a bygone era.